Ian and I visited a town called Alkmaar while we were on holiday. 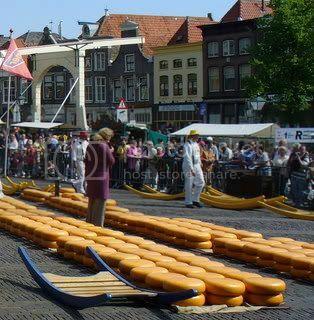 Every week they hold cheese auctions in the town centre and have market stalls lined up selling almost every kind of cheese you can think of. We arrived too late to see the whole of the 1/2 acre site covered in cheeses but these piccies give you an idea of what the auctions were like. 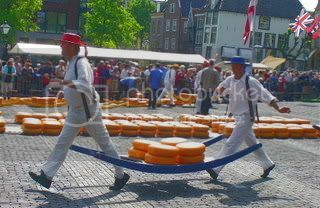 By the way, Ina's father used to work as a chesseman and carried the cheeses the way these two men are doing. 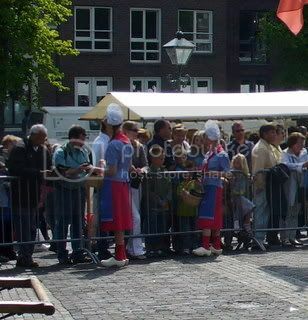 The costumes aren't just worn for the sake of the tourists these are the actual uniforms of the Dutch cheese workers. Wow! That's a lot of cheese! Man oh man thats a lot of cheese. Those uniform are also something else. 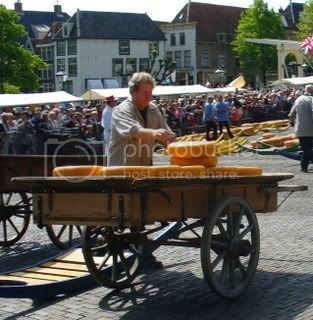 The cheese auctions are for business but the stalls round the town centre sell cheeses for anyone to buy. I think Ian tried each and every cheese there was for sampling and before we left Holland he bought 6 of the oldest, smelliest cheeses. My 'fridge smells as though it has month old, sweaty training shoes in it now!!!! Wow. What a great trip! I agree with Ian...Stinky Cheeses are the best! I always have at least 4 cheeses in the fridge drawer. My fave snack...Cheese (stinky or no), fruit (any), and a slice of nice crusty bread. Lovely. Grilled cheese sandwiches for supper now!